On behalf of the Assembly Committee on Social Services, I respectfully submit to you the Committee's 2001 Annual Report. This year, the Committee was successful in securing passage of a number of measures that will assist low-income individuals and families achieve greater economic security, thereby reducing the welfare rolls and the financial obligation of the State and local governments. Many of the legislative initiatives advanced by the Committee focused on the need to improve the current welfare system in order to provide recipients with the necessary support to transition off of public assistance. These measures include increasing access to employment and child care by reducing the transportation barrier that low-income households often face. Public assistance households will now be permitted to maintain their eligibility for public assistance while saving for the purchase of a first or replacement automobile. Recognizing the vital role that food stamps play in reducing hunger, the Committee took active measures to extend those benefits to additional New Yorkers. This year, legislation was enacted that will provide important nutrition assistance through the State Food Assistance Program to immigrants who are victims of domestic violence. Without this helping hand, this vulnerable population may otherwise be forced to remain in dangerous situations. The Committee also worked diligently to ensure that Medicaid benefits are delivered to our neediest citizens in an innovative and cost-effective manner through the extension of numerous demonstration programs. The Assembly was also successful in the continued rejection of a series of proposed budget cuts and programmatic changes in the State's social services programs. We have remained firm in our position that slashing services threatens the health and well-being of recipients and will only shift costs throughout the system. The Committee will continue its efforts to develop positive, cost-effective ways to assist public assistance recipients and to improve existing public assistance programs. During the upcoming months, the Committee will continue to focus on developing legislation that provides better alternatives than welfare to the "hard-to-serve" caseload. Next session, the Committee will push for legislation that would decrease poverty by increasing the availability and accessibility of educational programs to public assistance recipients. In addition, the Committee is awaiting the Federal Government's reauthorization of the Food Stamp program and the Temporary Assistance to Needy Families (TANF) block grant. Federal reauthorization of these programs will likely include programmatic changes that may require revisions in New York State's Social Services Law. The Committee members and I would like to take this opportunity to thank you for your support and leadership throughout the past session. We look forward to working with you in the 2002 session in order to protect and improve vital services for the indigent of our State. The Assembly Social Services Committee has jurisdiction over legislation affecting programs providing financial, medical, and support services to indigent households in New York State. The work of the Committee also affects the aged, blind, and disabled residing in the community and those in residential care facilities. The statutory basis for these programs is contained in the State Social Services Law. The Committee works closely with the Committees on Health, Housing, and Aging and with the Task Force on Food Farm and Nutrition Policy. The Committee is assisted in its programmatic responsibilities by the Legislative Commission on Skills Development and Career Education. The Committee has legislative oversight responsibilities for programs administered by the Office of Temporary and Disability Assistance as well as some programs administered by the Office of Children and Families, the Health Department and the Department of Labor. During the 2001 Session, the Committee reviewed 164 bills and addressed numerous issues aimed at protecting the State's indigent population. These issues included enhancing the availability of educational programs, a Medicaid buy-in program for disabled workers, numerous welfare reform issues, child support enforcement enhancements, extension of several Medicaid demonstration programs, and reauthorization of the Community Services Block Grant. This report describes the Committee's major legislative activities during the 2001 Session. In order to help needy aged, blind, or disabled persons on fixed incomes keep pace with rising expenses, the Assembly has consistently supported annual cost-of-living adjustments (COLAs) for Supplemental Security Income (SSI) recipients. This legislation increases the standard of need for eligibility and payment of federal SSI payments and additional State payments to reflect COLA increases during the first half of calendar year 2002. The legislation also makes corresponding changes to personal needs allowances provided to residents of congregate care facilities. The Welfare Reform Act of 1997 deemed specific resources as items to be exempted from consideration when the benefits of any household are calculated under any public assistance program. Current statute exempts and disregards as an asset various resources, such as savings up to $2,000, a primary residence, and an automobile valued at up to $4,650 or up to $9,300 if it is needed to seek or retain employment. Recognizing the barrier that a lack of transportation often plays in securing employment, this legislation seeks to expand the opportunity afforded public assistance households to purchase a vehicle. An additional exemption is added to permit households receiving assistance to retain an amount up to $4,650 in a separate bank account for the sole purpose of enabling the household to purchase a first or replacement vehicle in order to seek, obtain or maintain employment. Additionally, this bill extends until August 22, 2003, the provisions that specify such exemptions. The measure ensures that families do not have to divest themselves of everything in order to qualify for public assistance, when what they need is temporary assistance during a difficult time. Availability and access to quality child care remains one of the most important and one of the most difficult obstacles low-income families face. Securing child care service provides parents with the flexibility to secure employment and the assurance that their children and safe and being cared for. Recognizing this need, Chapter 391 of the Laws of 1999 was enacted to allow recipients of or applicants for public assistance who are working, yet still qualify for public assistance and guaranteed child care for children under 13 years of age, to choose to receive only the guaranteed day care subsidy and not the cash assistance. However, in September 2000, the Office of Children and Family Services issued a "Local Commissioner's Memorandum" that categorized those working, public assistance eligible families who choose to forgo cash assistance as a "priority" for districts to provide child care to, rather than as families who are "guaranteed" child care as the Legislature had intended. Many low-income families, although working, remain eligible for public assistance. However, they may choose to forgo the small amount of cash assistance they are eligible for in order to preserve their five years of time-limited federal public assistance. In most cases, these families can not forgo their cash assistance if they are going to lose the guaranteed child care. The child care assistance these families receive is vital for them to remain employed, is often worth far more than their cash grant and does not use up any of their time-limited benefits. This bill clarifies the language in statute so that working, eligible families who choose to forgo cash assistance are still guaranteed the day care subsidy. Under existing law, an applicant for or recipient of public assistance is permitted to contest a determination of disability or the suitability of a work assignment through the fair hearing process. In almost all cases, applicants and recipients have 60 days in which to request a fair hearing. However, current law only provides an individual with 10 days to request a fair hearing based upon a disability determination or unsuitability of a work assignment. It is unreasonable to substantially reduce the time allotted to disabled public assistance applicants and recipients. This bill would extend from 10 days to 60 days the time allowed for disabled persons to request a fair hearing on the suitability of a work assignment or a disability determination. Disabled public assistance recipients are frequently assigned to work activities that are either impossible to perform given their medical condition or hazardous to their health. These individuals are rarely able to meet the 10-day deadline to request a fair hearing because they are not informed of the specific duties to which they will be assigned until the 10 days has expired. Therefore, by the time they know whether the assignment exceeds their capabilities, it is too late to challenge it. This bill passed the Assembly but was not acted upon by the Senate. The current population of public assistance recipients faces substantial educational barriers that make it difficult to obtain and retain gainful employment. The Assembly has long recognized the importance education plays in providing persons with the skills and tools vital to advancement in the current work environment. Moreover, it has been proven countless times that earning capacity increases with each educational level gained. Sound public policy demands that public assistance recipients are afforded the opportunity to access the basic education skills necessary to lift them out of poverty and off of the public assistance rolls. Identifying this need, the Committee advanced legislation that would permit public assistance recipients to participate in valuable educational programs such as Adult Basic Education and English for Speakers of Other Languages (ESOL). Furthermore, the legislation provides that local social service districts would be permitted to include time spent in educational programs toward New York's federally mandated work participation rates. This legislation advanced to the Assembly Rules Committee. Five years ago, welfare was dramatically reshaped by the enactment of the Federal Personal Responsibility and Work Opportunity Reconciliation Act of 1996. This legislation eliminated the open-ended entitlement to cash assistance and instead implemented a 60-month time lifetime limit on the receipt of federal benefits. Because New York is required by its Constitution to provide support to the needy, most of these families will receive benefits through the Safety Net Assistance program. When New York enacted the Welfare Reform Act of 1997, which implemented the statute, the Legislature intended to provide a seamless transition from the federally-funded Family Assistance program to the Safety Net program. During the past year, it became evident that the Office of Temporary and Disability Assistance, our state welfare agency, intended to implement an unnecessary reapplication process for those families who have exhausted their federal benefits. This legislation would further clarify in statute the Legislature's intent to provide a seamless transition from Family Assistance to Safety Net Assistance. The Committee will continue to actively monitor the process throughout New York State and will strive to ensure that our neediest families are not faced with unnecessary hardship due to benefit errors during the transition process. This bill advanced to the Assembly Rules Committee. Improvements in the child support enforcement program are crucial to the economic well-being of children, not only for those receiving public assistance, but also for those whose standard of living is eroded by the lack of adequate income support from absent parents. This bill extends until June 30, 2003, the authority of the Department of Taxation and Finance to collect child support and combined child and spousal support arrears. The legislation employs the resources of the agency of State government whose institutional mission is already focused on the collection of unpaid and outstanding financial obligations in the enforcement of child support orders. Under the terms of this legislation, child support arrears which are four or more months past due will be subject to enforcement and collection action by the Department of Taxation and Finance, with such arrearages collectable in the same manner as would a tax obligation owed to the State of New York. This legislation extends for two additional years until June 30, 2003, the authority of the Department of Motor Vehicles to suspend the driving privileges of individuals who have accumulated more than four months of child support arrears. This program serves as a strong deterrence to those wishing to avoid support payments. Furthermore, this measure reinforces the message that refusal to pay court-ordered support to one's family will not be tolerated in New York State. Child support often plays a vital role in the economic security of low-income households. Under current law, the custodial parent of a child on public assistance only receives the first $50 of support the local department of social services collects from the non-custodial parent. Studies have indicated that non-custodial parents are often more willing to make regular payments to the child support enforcement unit when the custodial parent receives more of the payment, rather than using the payment to offset the cost of providing public assistance benefits to the custodial parent and child. This legislation would increase from $50 to $100, the maximum monthly amount of child support that may be passed on to the custodial parent of children in receipt of public assistance. The measure would also provide that any additional child support passed on to the custodial parent would be disregarded when determining eligibility for Medicaid. This legislation advanced to the Assembly Ways and Means Committee. Many families who receive public assistance have child support collected on their behalf. All but the first $50 collected each month goes to reimburse the State and county for public assistance paid to the family. When the adults in such families are assigned to workfare, the number of hours assigned are calculated by taking the size of the grant and dividing it by the minimum wage. The resulting number is the hours of work to which the adult is assigned, even if a substantial amount of the grant is reimbursed by child support collections. This legislation would require local districts to deduct any child support collected from the public assistance grant before calculating workfare hours. Under current law, social service districts may take liens against homes, personal injury awards, inheritance and financial windfalls received by recipients and former recipients to repay the district for assistance paid to the family. However, statute does not require districts to first deduct from the lien amount the child support the district collected. Therefore, the district could be paid twice and unjustly enriched. This legislation would also provide that districts could not assert any lien to recover public assistance payments if such payments were reimbursed by child support collections. This bill passed the Assembly, but was not acted upon by the Senate. Currently, Medicaid recipients who enter adult care facilities are considered residents of the district in which the home is located. This places an inequitable financial burden on those counties that host a number of adult care facilities. This bill provides that the social services district from which an individual was admitted to an adult home, enriched housing program, or residence for adults would pay Medicaid expenses, not the county where the residence is located. Assigning Medicaid fiscal responsibility to the county where the resident is from recognizes that adult care facilities care for residents not only from the county where the facility is located, but often from a much wider area. This measure will further remove the potential financial disincentive to counties to expand adult care facilities or enter the adult care industry. The Foster Family Care Demonstration Program for elderly or disabled persons is one of numerous attempts made by the State to reduce the rising costs of Medicaid. It was established as a cost-effective, community-based alternative to care in a residential health facility. Individuals who are medically eligible for residential health care or personal care services and who are without a home or family support, live in the community with participating caregivers. The caregivers provide room and board, supervision, and assistance with personal care in their home. A sponsoring agency supervises the care and is also responsible for recruitment and training. Because of the program's continued success, this legislation extends the Foster Family Care Demonstration Program for two additional years, until December 31, 2003. Since 1985, the Department of Health has sought waivers from the federal Social Security Act under which home and community-based services are provided to physically disabled children who would otherwise be placed in medical institutions. This program, commonly known as the "Katie Beckett" program, enables physically disabled children to be cared for at home under Medicaid at lesser cost than in a medical institution. Without this program, approximately 600 children in New York State would not be able to live at home with their families and receive the necessary medical care, but rather would be institutionalized in either hospitals or nursing facilities. This legislation, which extends the Care at Home Program until December 31, 2002, will provide families with flexibility and choice when caring for their disabled children. Comprehensive health services plans allow recipients of Medical Assistance to have access to a variety of medical services in the most cost-effective manner available. This bill extends the statutory authority for the Comprehensive Health Services Plan and the Physician Case Management Program for one year, until July 1, 2002. This legislation also extends statutory authority to provide six months of guaranteed Medicaid eligibility for Safety Net recipients enrolled in comprehensive health services plans. The provisions of this legislation were included in budget bill A.9268 (Rules), which was signed into law as Chapter 63 of the Laws of 2001. The Child Assistance Program (CAP) is a voluntary cash benefit and supportive services program for certain families who are eligible to receive public assistance. The program emphasizes both employment and child support as the primary means for achieving and maintaining self-sufficiency. An equally important component to achieving self-sufficiency is the security of adequate health care coverage. However, low-income families without health care benefits may suffer enormous financial setbacks resulting from unexpected medical expenses. The bill extends until March 31, 2003, the provisions of Social Services Law that guarantee that CAP participants who become ineligible to receive Medicaid benefits solely due to increased earnings from employment, loss of earnings from employment, or loss of earned income disregards, will receive Medicaid for an additional 12 months. In 1996, the Medical Assistance Presumptive Eligibility program was expanded in response to the delays that often occur when a hospitalized patient is moved to more appropriate levels of care. Under the program's provisions, certain hospital patients who are transferred to hospice or residential health care facilities are deemed presumptively eligible for Medicaid for 60 days. The program succeeds in reducing the delay of appropriate care by essentially eliminating the period of time a patient has to remain in a hospital, rather than in a more appropriate facility, until a determination of Medicaid eligibility is made. This bill extends until July 31, 2003, the Medical Assistance Presumptive Eligibility Program, which ensures that an uninsured individual who is transferred from a hospital to a residential facility providing health care services has continuous access to medical care by being presumed eligible for Medical Assistance for 60 days. Comprehensive health services plans are recognized as an efficient and cost-effective means of delivering a variety of medical services to individuals who are in receipt of Medicaid. Cost control is achieved by managing health care so it is provided in the most appropriate setting. In an effort to encourage Medicaid recipients to participate in comprehensive health services plans, the federal Social Security Act permits states to guarantee continued Medicaid eligibility for individuals enrolled in federally-qualified comprehensive health services plans whose Medicaid eligibility would have been terminated before the end of a six-month period beginning on the date of the individual's enrollment in a comprehensive health services plan. This bill encourages participation in comprehensive health services plans by extending for an additional year, the provision guaranteeing Medicaid eligibility for six months to Family Assistance recipients enrolled in comprehensive health services plans. Many disabled individuals would like to work but cannot accept employment that offers a livable wage because they would lose their Medicaid coverage. Existing Medicaid income and resource limits prevents disabled persons from earning enough to support themselves or their families. As a result, disabled individuals who are capable of working must choose to forgo employment and a career in order to maintain their Medicaid eligibility. Under the federal Ticket to Work and Work Incentives Improvement Act of 1999 (P.L. 160-170), states have the opportunity to expand Medicaid coverage for disabled individuals who are employed. This program would create the opportunity for self-sufficiency of many disabled workers. This legislation, the Work and Wellness Act, would create a Medicaid Buy-In program that permits disabled workers to buy into the Medicaid program by paying premiums on a sliding scale based on their income. This legislation passed the Assembly, but was not acted upon by the Senate. School-based health services are recognized as a highly effective vehicle for delivering crucially needed, timely health care services to the most vulnerable underserved and uninsured school-age children. The Department of Health, on several occasions, has delayed the requirement that managed care programs contract with school-based health centers. Although managed care programs require each enrollee to choose a primary care practioner, the programs will generally only contract with physicians as primary care practioners. Since school-based health centers use mostly nurse practioners, physician's assistants and certified social workers with back-up of physicians and psychologists or psychiatrists, managed care programs are unlikely to contract with school-based health centers as primary care providers who are enrolled in managed care. This legislation would add school-based health services to the list of current Medical Assistance services that managed care providers are not required to provide. By adding such services to the list, managed care providers would be statutorily required to establish procedures to assure participant access to school-based health services. This bill would maintain a reasonable balance between the development of managed care programs and the need to assure continued access to school-based health services. This bill passed the Assembly, but was not acted upon in the Senate. Under current law, a supplemental needs trust may be established for the benefit of an individual with a severe and chronic or persistent disability. The purpose of the trust is only to supplement, not supplant, any government support that the trustee receives. As part of the federal Omnibus Reconciliation Act of 1993, certain individuals with disabilities are permitted to place assets, such as those derived from a personal injury award, into a supplemental needs trust prior to the State claiming reimbursement for past Medicaid costs paid on behalf of the trustee. The State can, however, claim its past Medicaid costs from the balance of the trust, after the death of the trustee. However, due to an ambiguity in New York statute, the State has continued to place Medical Assistance liens on assets belonging to individuals with disabilities. This practice, in addition to being in conflict with federal law, prevents a disabled Medicaid recipient from their right to legal redress when injured, because of the prospect that any compensation awarded may be confiscated. This legislation would correct the statutory ambiguity by prohibiting the State from attaching a Medical Assistance lien to a supplemental needs trust for the amount held in the trust. Additionally, the bill would provide that no lien may be enforced against the proceeds of any personal injury action, claim, suit, counterclaim, or demand to the extent that such funds are deposited into a supplemental needs trust. This legislation passed the Assembly, but was not acted upon in the Senate. While Medicaid allows for a broad definition of medical necessity, Medicare does not. Medicare was established specifically to meet the health care needs of the elderly and does not recognize the equipment needs of adults with developmental disabilities the same way Medicaid does. The difficulty arises for individuals with disabilities who are dually eligible for Medicare and Medicaid. Because Medicaid is the payor of last resort, submission to Medicare is required prior to requesting funding from Medicaid. For example, if an individual who is dually eligible is prescribed a specialized power-adapted wheelchair, Medicare may only approve and pay for a percentage of a less expensive and less appropriate version of a wheelchair, and Medicaid would cover the balance. However, if the individual were only eligible for Medicaid, Medicaid would likely have approved and paid for the more appropriate wheelchair, which meets the needs of a disabled individual. This legislation would increase accessibility to durable medical equipment for developmentally disabled individuals who are dually eligible for Medicaid and Medicare by requiring that the Medicare reimbursement level for the purchase of such equipment is no less than the Medicaid reimbursement level for individuals without Medicare coverage. This legislation passed Assembly but was not acted upon by the Senate. For victims of domestic violence attempting to leave an abusive situation, the assurance that an abuser cannot learn where a victim is residing is one of the most important components of ensuring the victim's safety. Current statute only guarantees the confidentiality of the street address of a residential domestic violence facility after the facility is operational and is applying for funding. This legislation seeks to further ensure the safety of domestic violence victims by providing for the confidentiality of all information, which is found in an application to the State or a local agency, relating to the location of a facility anticipated to house a domestic violence program. The lack of alternative housing may often prevent victims of domestic violence from leaving their home, where the abuse likely occurs. These victims may not have adequate financial resources to pay for housing, while they are trying to support themselves and their children. This legislation would provide temporary assistance to victims of domestic violence by requiring social services district to offer and provide housing subsidies to certain domestic violence victims. Such subsidies would be available for no more than one year and would be provided in amount equal to 70% of the rental cost of a unit or the median housing rental cost for the county, whichever is lower. Additionally, the prevailing cost of rent for the area cannot exceed 80% of the cost for the region. Unfortunately, many victims of domestic violence and their minor children are turned away from shelters due to a lack of available beds. Until additional space is provided, victims will continue to be denied shelter when they need it most. However, there have been reports that, in some cases, women accompanied by adolescent boys may be inappropriately denied shelter based on certain shelter policies excluding teens, rather than on a case-by-case determination of shelter availability. This bill would provide a step toward remedying this situation by requiring the Office of Children and Family Services (OCFS) to include within their annual report on domestic violence, the specific number of persons denied shelter or services who were accompanied by a minor child, including the age and gender of such child. The legislation would also require the report to include whether an alternative referral was made. The State Food Assistance Program (FAP) was created as part of welfare reform in order to give counties the option to provide food stamp benefits to persons made ineligible for the federal Food Stamp Program as a result of the enactment of the Personal Responsibility and Work Opportunities Reconciliation Act of 1996. The program is designed to assist the more vulnerable populations of legal immigrants who lost their federal benefits as a result of their immigrant status. In order to receive FAP benefits, such persons must: meet the income threshold limits for the federal Food Stamp program; have been living in the U.S. and residing in the same local social services district in which the application for FAP is being made as of August 22, 1996; be under age 18; or elderly or disabled. In 1998, the federal government restored federal Food Stamp benefits to legal immigrants who are under 18 years of age, disabled or over 65 years of age on August 22, 1996. Because of these federal changes, the current State FAP provides benefits to legal immigrants between the ages of 60-65 who meet the other program requirements. This legislation extends the State FAP until September 30, 2003. Additionally, this bill further expands FAP benefits to certain legal immigrants who are victims of domestic violence. Consistent funding for FAP has been supported by the Legislature and the Governor and more than adequately provides for the expansion of FAP benefits. The extension of these benefits to immigrant victims of domestic violence may provide the helping hand to encourage these individuals to leave a dangerous situation. Transportation often poses one of the more formidable barriers to self-sufficiency for welfare recipients. For individuals who are trying to balance employment, family duties, and the programmatic requirements of public assistance, travelling to and from an inconveniently assigned local social services office can be time consuming or in some cases nearly impossible. This bill would permit applicants for public assistance to choose the local social services office most accessible to their residence, provided that the office is within the local social services district and that such office has the capacity to accommodate the assignment. The bill would further require the social services office to notify recipients, in writing, of the option. These provisions would ensure that applicants and recipients would not have to travel to a randomly assigned office or incur unnecessary expenses. Further, the social services office would likely be more accessible and responsive to the community it serves. In order to continue to move in the direction of bringing persons with disabilities into the mainstream of our society, it is necessary to promote policies and programs that eliminate the barriers that inhibit such inclusion. Many persons with disabilities are unable to access employment, education and other opportunities due to barriers inherent in our society. Those barriers include the fact that motor vehicles are not designed to accommodate persons with particular disabilities. It is encouraging to note that a number of specialty manufacturers are producing adaptive equipment for persons with disabilities, which allows them to operate a vehicle. This equipment accommodates the use of a wheelchair in a vehicle, provides necessary steering or braking systems, and remedies other dilemmas associated with having a disability and the operation of a motor vehicle. Unfortunately, the cost of purchasing these adaptive devices may be prohibitive to persons of families that do not have the necessary resources. This bill would authorize the Office of Temporary and Disability Assistance to establish the Mobility Reimbursement Program for Persons with Disabilities in order to assist such persons overcome barriers to employment. The program would reimburse applicants, whose income must be less that 300% of the Federal Poverty Level, for the initial purchase, replacement and installation of essential equipment used for daily transportation needs. The reimbursement amount would be limited to 50% of the cost of the equipment or $1,000 per applicant, per year, whichever is lower. Without programs that provide incentives for the disabled to access employment, education and other opportunities, many individuals will be excluded from the day-to-day activities that the majority of persons enjoy. This legislation seeks to correct a provision in the anti-displacement provisions of the New York State Social Services Law. Currently, the law contains displacement language which forbids a public employer from utilizing workfare participants in such a manner as to result in the displacement, or partial displacement, of the regular workforce. In order to permit a collective bargaining representative to monitor a public employer, such employer must provide a monthly statement of the number, location, agency and assignment of workfare participants. Although the public employer discloses no information about individual participants, the law nevertheless requires the collective bargaining representative to keep the information confidential. This stricture deprives the collective bargaining representative of the ability to fully inform its members of the employer's use of workfare participants. It further prevents a union from notifying interested members of the public as to the number of workfare participants and how the public employer is utilizing them to perform work for the public. This legislation would correct this situation, and at the same time would protect welfare recipients from the disclosure of confidential information. This bill passed the Assembly, but was not acted on by the Senate. In 1996, the nation's welfare system was dramatically reformed with the enactment of the Federal Personal Responsibility and Work Opportunity Reconciliation Act of 1996 (PRWORA). The federal law adopted a "work first" approach, eliminated the entitlement to cash assistance, and imposed time limits, work requirements and sanctions. The cornerstone of the law was the creation of the Temporary Assistance to Needy Families (TANF) Block Grant, which provides $16.5 billion to states to fund their cash assistance and welfare-to-work programs. New York receives $2.443 billion for the Family Assistance Program through the federal TANF block grant. SFY 2001-02 is the fifth year of the TANF block grant. The amount of New York's allocation is based on the State's public assistance caseload and expenditures in FFY 1995. New York's caseload and resultant expenditures were significantly higher in 1995 than the caseload for SFY 2001-02. Thus, the State has approximately $1.5 billion in federal TANF funding above what is need to support the federal share of the Family Assistance Program. These funds are referred to as the "TANF Surplus." The 1996 law requires Congress to reauthorize the TANF block grant by October 1, 2002, in order to continue federal funding. Since the implementation of PRWORA, New York has developed one of the largest unexpended TANF surpluses in the country. Should the State continue its trend of not disbursing funds that have been appropriated from the TANF surplus, these unexpended funds could be subject to federal recapture during TANF reauthorization negotiations. The Assembly asserts that these funds should be disbursed expeditiously to help prevent low-income New Yorkers from falling deeper into poverty and to assist public assistance recipients as they move toward self-sufficiency. The 2001-2002 State budget includes $937 million to support benefit payments to low-income New Yorker's through the Family Assistance, Safety Net Assistance, and Emergency Assistance to Families programs. Federal Community Services Block Grant (CSBG) funds are awarded to grantees in all counties in New York State. Community action agencies, community-based organizations, and Indian tribes or tribal organizations receive CSBG funds to provide advocacy, outreach, services, and programs for economically-disadvantaged persons in their local communities. On June 5, 2001, the Assembly Social Services Committee, the Senate Social Services Committee, and the Assembly Ways and Means Committee held a joint public hearing on the Community Service Block Grant program. The purpose of the hearing was to obtain input regarding the New York Department of State's CSBG Management Plan for federal fiscal year 2002-2003. The management plan delineates the manner in which funds will be expended and how the State will meet the federal CSBG program requirements. 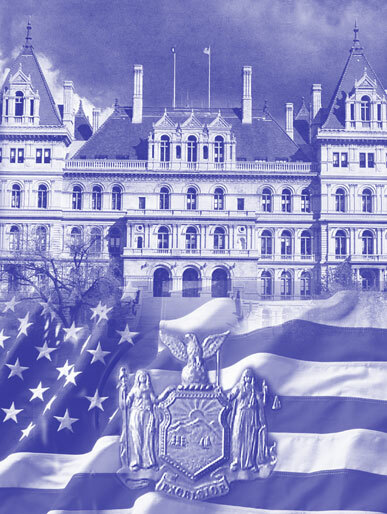 On March 2, 2001, the Assembly Committees on Social Services, Children and Families, Labor, and the Assembly Taskforce on Skills Development and Career Education held a joint public hearing on New York's Summer Jobs program. The purpose of the hearing was to examine the benefits gained by youths who participate in the Summer Jobs program. New York has had federal funding for a summer jobs program for youth for over 30 years. Programs under the Comprehensive Employment and Training Act (CETA) and the Job Training Partnership Act (JTPA) involved thousands of teenagers in summer employment opportunities that provided participants with employment experience, income, and a productive outlet that channelled their time and energy. However, summer jobs programs have been affected significantly by the enactment of the Workforce Investment Act of 1998 (WIA). Although teenage unemployment, particularly in New York City, runs at nearly 23%, well above the national average of 13.9%, "stand-alone" summer employment is no longer a program option under the new federal language. The increased requirements of a WIA youth program dramatically limits the number of youth who can be served. Since many youth use the income earned during the summer for school clothes and other necessities, there is an economic cost to both teenagers and their families. There is also an effect on employers who depend on summer jobs funding to cover seasonal employees. The Summer Jobs Program supported by federal and local dollars last year served over 40,000 youth statewide, of which 30,000 were from New York City. Morahan Referred to Codes Would provide tenants receiving housing assistance the option of petitioning the local commissioner of social services to withhold the rent of petitioning tenants residing within hazardous residences. Jacobs Referred to Ways and Means Would allow immigrants to receive federally-funded emergency Medicaid. Jacobs Referred to Ways & Means Would create a Medical Assistance Sponsor Buy-in Program. Jacobs Referred to Ways & Means Would permit certain Article 28 clinics to receive Medical Assistance payments for the provision of psychotherapy services by certified social workers. Marchi Passed Assembly Would enact the Work and Wellness Act of 2001. Marchi Referred to Ways & Means Would extend the current Medical Assistance Presumptive Eligibility Program until July 31, 2002, and establishes that uninsured persons in need of care, services, and supplies for mental illness are presumptively eligible for Medical Assistance following release from certain facilities. Cook Rules Calendar 786 Would require OTDA to apply to the USDA for federal Food Stamp Program waivers, and also require OTDA to direct local social services districts to provide federal benefits to eligible persons. Luster Referred to Rules Would require more specific data collection relating to services provided to applicants for and recipients of public assistance programs for the purposes of evaluating welfare reform. Koon Passed Assembly Would require that information related to the location or address of residential programs for victims of domestic violence are to be kept confidential. Lopez Passed Assembly Would require social services officials to provide applicants with written information regarding the option to choose the most accessible social services office provided that such an office has the capacity to accept such individual. Weinstein Referred to Ways & Means Would increase the amount of child support that could be retained by families without affecting their eligibility for public assistance. Stringer Referred to Codes Would prohibit the State, or any political subdivision, public authority, employee, or agent from compelling a victim of domestic violence to contact his or her abuser, directly or indirectly, for any reason. Lopez Referred to Rules Would require OTDA to set performance standards for local districts' fair hearing procedures and to evaluate local district performance. Smith, M. Amended and Recommitted to Ways & Means Would raise the personal needs allowance of residents of residential health care facilities from $55 to $100 per month. Seward Passed Assembly Would add school-based health services to the list of services which need not be provided by a managed care program, thus assuring that Medicaid managed care enrollees have continued access to such services. Gottfried Referred to Ways & Means Would extend the provisions which authorized Medicaid transitional supplemental payments to community-based health care providers, and also extends provisions which authorize payments to academic facilities providing dental services. Goodman Calendar 93 Would ensure that Medicaid recipients are able to access all covered services. Spano Passed Assembly Would provide that supplemental needs trusts may be established without the payment of any medical assistance lien attached to the amount to be held in such trust. Hannon Passed Assembly Would require every social services to offer and provide housing subsidies to certain victims to domestic violence. Morahan Chapter 433 Requires the county of origin to pay for Medicaid costs of a resident in an adult care facility. Saland Chapter 200 Extends certain foster care demonstration programs until December 31, 2003. Meier Chapter 331 Extends the home and community-based services waiver program to disabled children who would otherwise be placed in medical institutions. (provisions of this bill were included in Part C, §11 of Chapter 63) Extends statutory authorization for the Comprehensive Health Services Plan, the Physician Case Management Program, and the authority to provide six months of guaranteed Medicaid eligibility for safety net recipients enrolled in comprehensive health services plans. Glick Referred to Ways & Means Would exclude wage subsidy and grant diversion program work activity from public assistance time limits. Gianaris Referred to Ways & Means Would provide for a cost-of-living adjustment to the State portion of the Supplemental Security Income benefit. Meier Chapter 12 Extends the authority for CAP participants who become ineligible to receive Medicaid benefits solely due to increased earnings from employment or loss of earned income disregards, to receive Medicaid for an additional 12 months. Glick Referred to Rules Would prevent local departments from recovering payments of public assistance if such payments were reimbursed by child support collections or through work activities performed in exchange for the public assistance grant. Glick Referred to Rules Would expand the list of activities that apply toward the work participation rate to include work preparation training and other work-related activities set forth in an Individualized Plan for Employment developed pursuant to the Federal Rehabilitation Act. Glick Passed Assembly Would extend from 10 days to 60 days, the time allowed for an applicant for, or recipient of public assistance to contest a disability determination or a work assignment. Weinstein Referred to Ways & Means Would allow an applicant for Medicaid to receive benefits provisionally while continued reasonable efforts are made by the applicant to sell excess non-liquid assets. Weinstein Passed Assembly Would reduce the amount of any lien imposed by the local department of social services to recover public assistance grant payments if such payments were reimbursed by child support collection. Gottfried Referred to Ways & Means Would allow Medicaid recipients to maintain their health coverage despite failure to participate in drug and alcohol abuse screening. Weinstein Referred to Ways & Means Would require "personal care services" to include assistance with activities of daily living, health and safety needs due to an individual's physical or cognitive impairments. Cahill Passed Assembly Would create a "Mobility Reimbursement Program for Persons with Disabilities" within OTDA. Spano Referred to Ways & Means Would create the "Empire State Jobs Program." Padavan Referred to Codes Would require persons who are subject to child abuse reporting requirements to also report suspected cases of animal abuse or maltreatment that they may encounter during the execution of their official duties. Carrozza Passed Assembly Would require OCFS to include in their annual report, the specific number of victims of domestic violence accompanied by minor children who were denied shelter or services, and whether an alternative referral was made. Ortiz Referred to Ways & Means Would expand the State Food Assistance Program and make it permanent. Sullivan, E. Referred to Ways & Means Would expand the lists of educational activities that may be available to certain public assistance recipients. Meier Chapter 89 Ensures that individuals receiving Supplemental Security Income (SSI) are provided with adequate allowances. Cahill Passed Assembly Would provide that the Medicaid reimbursement level for the purchase of durable medical equipment for individuals who are dually eligible for Medicaid and Medicare shall be no less than the Medicaid reimbursement level for individuals without Medicare coverage. Saland Chapter 68 Extends the authority of the Department of Taxation and Finance to collect child support and combined child and spousal support arrears from June 30, 2001 to June 30, 2003. Saland Chapter 72 Extends the expiration date of the driver's license suspension program from June 30, 2001 to June 30, 2003. Glick Referred to Rules Would permit public assistance recipients to participate in certain education programs, and allows local districts to receive full credit towards participation rates from such participation. Glick Referred to Rules Would prevent an interruption in public assistance benefits for families who transition into the Safety Net assistance program because they are no longer eligible for Temporary Assistance to Needy Families (TANF) due solely to the 60-month time limit. Skelos Referred to Ways & Means Would exempt Medicaid-eligible residents of adult care facilities from the pharmacy co-payment requirement. Meier Amended and Recommitted to Ways & Means Would provide for the expansion of authorized assisted living beds for certain counties unable to meet the demand for such beds. Meier Chapter 207 Extends until August 22, 2003, provisions that specify those resources which are exempt and disregarded when calculating the amount of benefits of any household under any public assistance program. Rules (Glick) Referred to Rules Would eliminate the statutory authority allowing social services officials to receive and dispose of a deed, mortgage, or lien on behalf of the local social services district providing assistance and care to a public assistance recipient. Meier Chapter 362 Extends the State Food Assistance Program (FAP) for two years and adds certain victims of domestic violence to those eligible to receive program benefits. Meier Chapter 566 Clarifies the intent of Chapter 391 of the Laws of 1999 to guarantee that certain public assistance recipients are eligible to receive child care assistance. Maziarz Chapter 145 Extends the Medical Assistance Presumptive Eligibility Program until July 31, 2003. Hannon Chapter 79 Extends the statutory authority to provide six months of guaranteed Medical Assistance eligibility to Family Assistance recipients enrolled in comprehensive health services plans until December 31, 2002. Meier Veto Message 52 Would provide for a limited disregard of nonrecurring lump-sum income by public assistance recipients if applied toward certain allowable expenses within 90 days of receipt. Rules Passed Assembly Would expand the list of parties that may receive a public employer's monthly report on its work experience program while protecting the confidentiality of program participants. Morahan Requires the county of origin to pay for Medicaid costs of a resident in an adult care facilities. Saland Extends certain foster family care demonstration programs until December 31, 2003. Meier Extends the home and community-based services waiver program to disabled children who would otherwise be placed in medical institutions. Meier Extends the authority of certain Child Assistance Program (CAP) participants who become ineligible to receive Medicaid benefits, to receive Medicaid for an additional 12 months. Meier Ensures that individuals receiving Supplemental Security Income (SSI) are provided with adequate allowances. Saland Extends the authority of the Department of Taxation and Finance to collect child support and combined child and spousal support arrears from June 30, 2001 to June 30 2003. Saland Extends the expiration date of the driver's license suspension program from June 30, 2001 to June 30, 2003. Meier Extends the provisions that specify exempt and disregarded resources when calculating the amount of benefits of any household under any public assistance program until August 22, 2003. Meier Extends the State Food Assistance Program (FAP) for two years and adds certain victims of domestic violence to those eligible to receive program benefits. Maziarz Extends the Medical Assistance Presumptive Eligibility Program until July 31, 2003. Hannon Extends the statutory authority to provide six months of guaranteed Medical Assistance eligibility to Family Assistance recipients enrolled in comprehensive health services plans until December 31, 2002. Meier Clarifies the intent of Chapter 391 of the Laws of 1999 to guarantee that certain public assistance recipients are eligible for child care assistance. New York State's welfare reform efforts are predicated on the belief that individuals in need of financial assistance can attain self-sufficiency if provided with the skills and opportunity needed to maintain full-time employment. In order to achieve this goal, it is necessary to recognize that many other factors, such as affordable housing, access to child care, higher education, reliable transportation and funds to meet emergency needs contribute to a family's ability to maintain independence. Because of this recognition, certain income and assets are disregarded when a family first applies for public assistance. However, should a family on public assistance receive a nonrecurring lump sum of income, they are prohibited from utilizing those funds to obtain any of the assets that public assistance applicants are allowed to possess at the time of the initial application. Instead, that family would be prohibited from receiving public assistance for a period of months derived by dividing the amount of the lump sum by the monthly public assistance grant. This bill would provide that up to $25,000 of nonrecurring lump sum must be disregarded as income and excluded as an asset if applied within 90 days of receipt to resources that are currently exempted when determining eligibility for public assistance or if used for expenses related to education or job training to attend an accredited or approved postsecondary education or training institution. Despite the Legislature's intent to encourage welfare households to save and invest in their future, the Governor vetoed this legislation.